Bathrooms are the smallest and the wettest rooms in our homes. With our lives getting busier by the day, a well designed bathroom will not only make our early morning rush hour less stressful but also provide us a peaceful sanctuary after a hard day’s work. Here are some changes you can make to your existing bathroom to take it from Blah to BLING! Standard efficiently designed bathrooms have a tub, double vanity or pedestal sink, and toilet lined up against one wall, known as "the wet wall." If this layout is getting on your nerves and your standard sized bathtub has just enough space to wet your elbows when you shower, then consider removing the tub ... and installing a walk-in shower with a frameless glass enclosure. Include niches for bath accessories. Additional storage can be installed at a certain height on the wall, making space for foot traffic. This arrangement will create a spacious feel as it makes the vision flow beyond the tub and the shower curtains that were obstructing the line of sight. The greatest challenge homeowners face in selecting a finish is trying to achieve visual appeal, durability and maintenance, all in a single tile or finish. While this is possible, it's important to select a material that will not blow your budget. An excellent design tip while selecting tile is “Keep it Classic, Accent with Popular.” Often finishes are hot for a year or two and then fade as newer and more with-it finishes enter the market. Don’t get carried away by a product that is trendy. Classic finishes, like wainscoting, are a hit in powder rooms. Wallpapers are making a comeback and are reasonable priced alternative finishes if you are willing to install them yourself. Try something new if your standard 3-light vanity fixture does not create an ambiance you love. As well as functional, lighting should create a soothing environment that helps calm and relax during a shower. To achieve this effect, hire an electrician to install a medium-sized chandelier in the center of the bathroom or above the Jacuzzi, paired with a row of colored blown-glass light fixtures by an accent wall (the wall across from the vanity is a great location). These light fixtures would typically be installed above a kitchen breakfast counter or a bar table. But who says you can't use them in the bathroom? We are here to break the mold and customize your space. Concealed lighting is always great, especially if you have a decorative stepped ceiling. Everybody loves bathroom accessories like towels, floor mats, frames and vases, but choosing the best ones in the right quantities can be tough. Don’t be a victim of monotone monarchy. 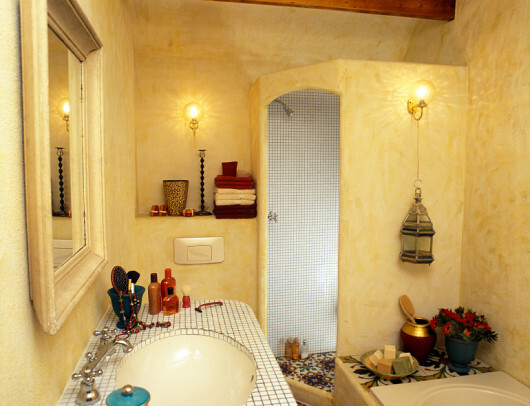 Contrast your accents, and take care to compromise on the color and pattern if you already have a stunning bathroom. For an all white bathroom, splurge on rich colors and patterns, always keeping in mind the essential design principle of balance and harmony.